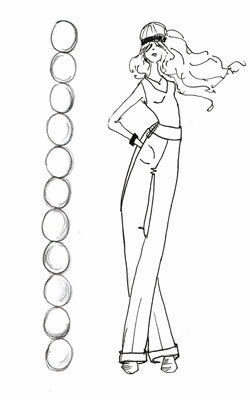 Long and lean is the overall motto of fashion design for women! Legs, arms, and torsos on female bodies are drawn at unrealistic lengths and widths. Male and children’s bodies are drawn a little more realistically, but they also have their own fashion proportion rules. Life-drawing class instructors often pound into students’ brains that the head fits into the average adult body seven to eight times. In other words, if you were to stack seven or eight heads on top of one another, you’d have the figure’s full height. Using the head as a unit of measurement helps you establish the proper proportions between the different parts of a figure. In most fashion illustrations, the head fits into the adult body 11 times. This rule, often called the head count, illustrates one of the biggest differences between figure drawing and fashion drawing, and it’s the one most responsible for the elegant look of fashion illustration. The head count keeps the figure’s head small in relation to the body and helps you lengthen the arms and legs in a graceful way. Using your finger and thumb as a measuring tool, count down 10 heads below the shape you just sketched and draw a line. This line shows you roughly how tall your fashion figure needs to be. Trace your fashion head and move it down along the page (below the one you just drew) ten times for easy visualizing. Keep in mind that the rule of 11 heads is a great place to start in fashion drawing, but it’s not the be all, end all rule. As you establish your own style, you can decide when and where you want to follow that rule and when and where you want to break it. But whatever head count you use, be sure to go tall! Models are taller today than ever; some are practically skyscrapers, standing over 6 feet. Because fashion is all about keeping up with the times and even projecting looks for the future, your drawings must reflect that as well. In the real world, although men are generally taller and broader than their female counterparts, men’s and women’s proportions are about the same. But in the fashion illustration world, things get a little more complicated. 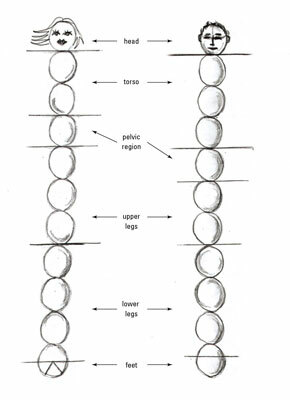 Both men and women are 11 heads tall, but you must distribute the height differently: Women have longer legs, whereas men have longer torsos. Children’s proportions: So cute, so different! You can’t forget the littlest of models. Though children may be mirror images of their parents as far as facial features go, kids are extremely different from their parents in terms of proportions, a fact that’s reflected in fashion drawing. 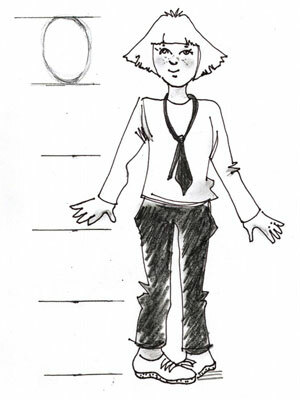 In fashion drawing, a child’s head fits into his or her body about 5 times, compared to 11 times for an adult. Obviously, adults are much taller than children, but their other proportions, including head size and neck length, are also completely different. Every little kid has a big head, relatively speaking. Kids also don’t have long, elegant necks, even for fashion illustration. Children 10 years old and older start to shoot up in height and grow into more-adult proportions. Here’s the most important proportion-related rule to keep in mind when drawing kids: Fashion kids don’t have long, lean body lines. Although kids can look really hip instead of prim, you still don’t want to exaggerate the body as you would do with an adult in fashion illustration. A long, willowy neck on a 9-year-old would be pretty odd looking! Stay away from long, lean, and mean lines for now, and keep kids looking like kids for as long as you can. The head fits into the figure’s full height only five times. One head is enough for the upper torso and neck, and 1 head is fine for the lower torso region. Two heads work from the hips to the feet.